We have always known that Tea has touting benefits on health. But, it was recently discovered that it is an effective beauty product, and you can easily include it in your beauty regimen for a fast beauty fix. Here are some simple home beauty remedies using tea. Soothing Tired Eyes: Are you sleep deprived often? Got puffed eyes with dark circles? Reduce the puffiness and dark circles under eyes with the help of tea. Just soak 2 tea bags in warm water, cool them and then place them on your eyes for 10 minutes. The caffeine in tea reduces the swelling by constricting the blood vessels and refreshes them instantly. Fights against dandruff: Chamomile tea can soothes irritated scalp as well as reduce and prevent dandruff. For that, rinse your hair with cold chamomile tea after you wash your hair. Deodorize stinky feet: Soak your feet in black tea to deodorize stinky feet. The tannin in the tea acts like an astringent and help you get rid of the odor. Stops razor burn: Shaving with a dull blade or too fast can often cause nicks. You can soothe them with the help of tea. Soak the tea bags in warm water and hold them on the cuts for few minutes to stop bleeding and stinging. 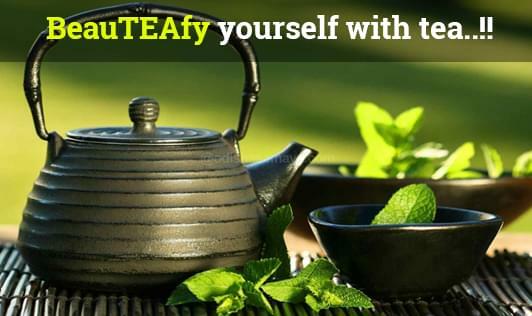 Treats acne: Green tea does wonders to your skin. The antioxidant in the green tea removes the dirt and impurities from the pores and keeps the skin soft and smooth. Mix the tea leaves with a cream cleanser, rub it on your face, keep for 5-10 minutes and wash it off.